We're still in Nuku Hiva. This is a beautiful anchorage. The mountains form almost an amphitheater around us, rising up to about 3,000' (1,000m) in lush green splendor just in front of us. The people are quiet and friendly. The prices are exorbitant but we're not planning to buy much, as we REALLY stocked up in Panama and Ecuador. Today Sue and I took an amazing hike. We started by walking the entire head of the bay to check on a FedEx package that's supposed to be here somewhere. Then we started walking up the 1 road that leads out of town. At the quarry we turned off the paved road onto a 4x4 track, and the track headed up smartly. After about an hour (during which time we snacked on guavas harvested from the trees around us) we came to a huge open area with massive stone works up-slope from us. The stone-works were house platforms, with steeply pointed A-frames on them (currently devoid of their palm-frond coverings). The front (up-slope) supports of these A-frames were carved Tiki-logs. Apparently, this area housed a large Polynesian population. The Marquesan population used to be about 100,000 but white diseases (smallpox, syphilis, etc.) have brought them down to only about 6,000 today. The missionaries also caused much of the culture to be lost, but as of 1980 there has been a concerted effort to resurrect, restore, and record earlier traditions. For instance, the Polynesian's gave us 2 words - taboo and tattoo - and now much of the population sports amazing tattoos. Many carved tiki-stones, grinding rocks, etc. were sprinkled around this large archeological site, but nobody was there to explain things to us. There were many more stone platforms below us, all overgrown with fig trees and looking like something out of an Indiana Jones movie. 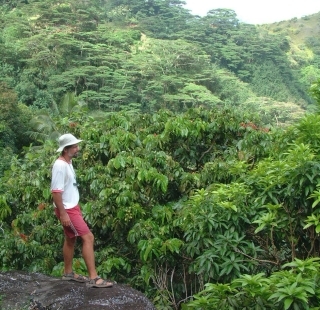 We half expected Harrison Ford to come leaping out of the underbrush, pursued by a rolling bolder or similar phenomenon. After a snack there the trail got steep and muddy and we wished for horses, but we were soon up the side of the ridge. We continued along another 4x4 track, harvesting lemons, limes and mangoes along the way until we got to "the famous mango tree lookout" where we stopped for lunch (we'd bought a big salad, sandwich and juice in town). When we finally got to the main road, we hitchhiked up to the top of the pass to view the far side. 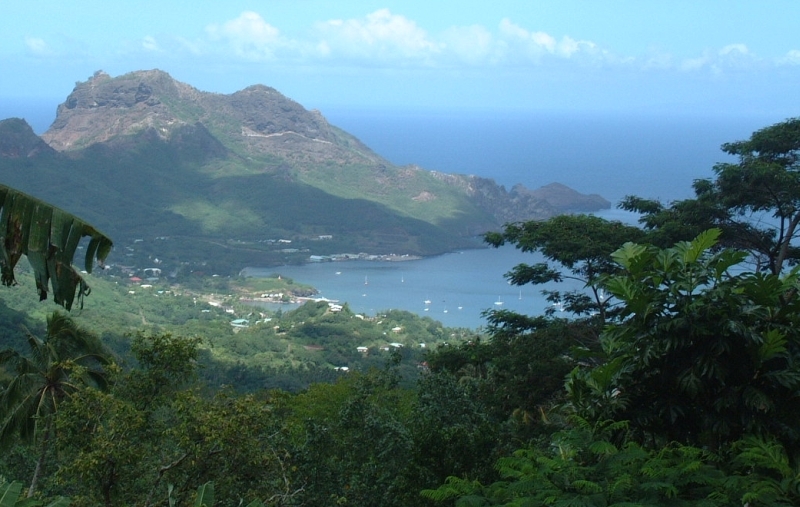 As we walked back down the pass, we were treated to stunning views of the town and anchorage below us, with huge mango and banana trees below us and massive cliffs above us. We didn't really want the magic to end, but a truck stopped for us (hitchhiking is so easy here) with cruising friends in back, so we piled in for the trip back down to town. We checked again but still didn't find our FedEx package. When we get it (tomorrow?) 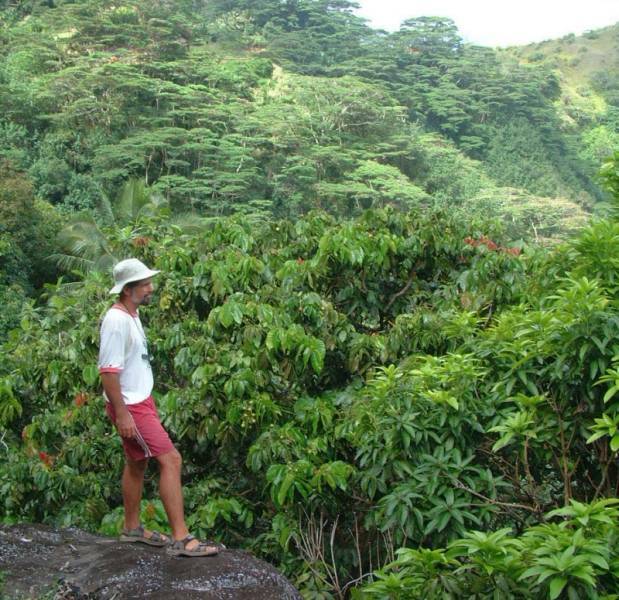 we'll head west about 5 miles to Daniel's bay which also has a nice walk past some 4 archeological sites and culminating with the worlds 3rd highest waterfall. Then sometime next week we hope to head over for the Tuamotus, a journey of about 4 days. 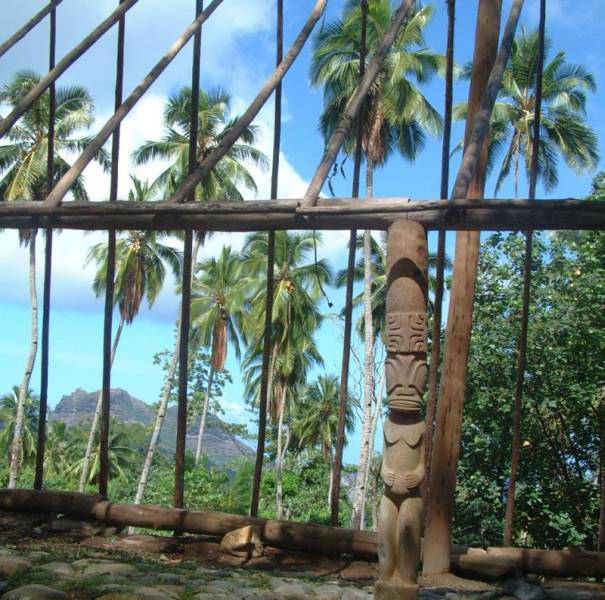 Click here to go the the Nuku Hiva Destinations page.